Buster was bred by Jeannette Stark & Mary Kapor, and was owned by Barbara and Michele Johannes. Buster was born on November 11, 1998 and died on November 3, 2010. 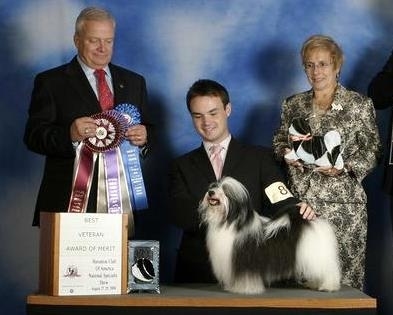 He was an extraordinary show dog, phenomenal sire, and the epitome and pinnacle of a Havanese throughout his life. His get and grandget have set new standards for the Havanese breed. He is our inspiration and touchstone of our show and breeding program. Buster was sired by Ch. Voila Prime Time, ROM and is out of Ch. Starkette Cookies and Cream, ROM. He is shown above with Adam King, DVM, who showed Buster to many of his show ring wins.